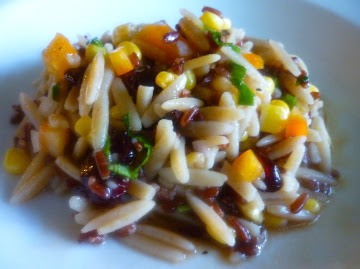 One of my summertime favorites was adapted by my friend, Marie as homage to j. alexander's popular orzo salad. Its great as a summer lunch or an accompaniment for dinner. When I eat at j. alexander, I usually pair this with their wood-fire grilled salmon... Mmm! I adjusted Marie's recipe a bit to suit my tastes... cause that's what it is all about! She adjusted their recipe to suit her... and the circle of creativity remains unbroken. Cook orzo and wild rice separately, per package direction, using chicken or vegetable stock instead of water. Drain, then briefly shock in cold water and refrigerate to chill. When chilled, place all ingredients in a mixing bowl including dressing and toss well. Serve very cold. Place all ingredients except oil, in small mixing bowl. Stir until blended. While vigorously stirring the mixture, slowly add oils. 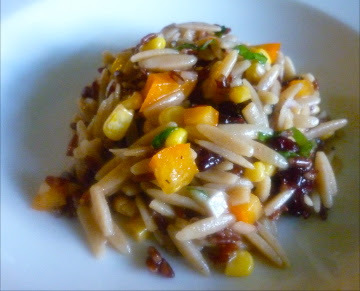 Toss with orzo and other salad ingredients.